The 2018 Kia Optima Hybrid has been given a totally new design in order to make it smarter, more stylish, and most of all, more efficient. One of these new features that improves the efficiency of the 2018 Optima Hybrid is the Active Air system. This feature is capable of closing the front air flow while traveling at certain speeds and in certain temperatures. This allows for the flap in the Active Air system to cut down on wind, and optimize efficiency. Even the engine itself help to maximize efficiency thanks to its direct injection technology that makes sure the engine doesn't waste any extra gas during your travels. Speaking of engines, the 2018 Optima Hybrid actually has two of them! Up front is the 2.0L Gasoline Direct-Injection engine, and in the back is an electric motor that works with the gasoline motor to bring you the perfect balance of power and efficiency. With these two motors working in tandem, the 2018 Optima Hybrid is capable of providing you with an EPA-estimated 46 miles per gallon on the highway, 39 in the city, and 42 miles per gallon combined! With fuel efficiency like that, you'll probably start to forget what a gas station looks like before it's time to refill your 2018 Optima Hybrid. 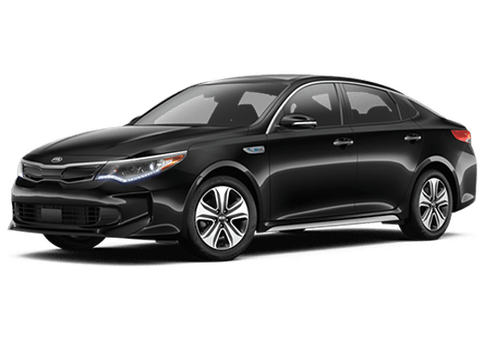 In addition to being one of the most efficient vehicles on the road, the 2018 Optima Hybrid is also one of the smartest vehicles you can buy. Thanks to a host of driver technologies, the 2018 Optima is capable of monitoring the area around itself in order to keep you and your family safe and sound on the road. The Blind Spot Detection System, for example, uses sensors along the sides of the Optima Hybrid to keep an eye out for other vehicles coming up alongside of you. When there is another vehicle next to you, an indicator light will illuminate on the corresponding side-view mirror to let you know it's not safe to change lanes. Because the engineers at Kia know that you want to be able to bring all of your favorite songs, apps, navigation contacts, and more with you everywhere you go, the 2018 Kia Optima is compatible with both Apple CarPlay™ and Android Auto™. By syncing up your compatible smartphone, all of your favorite features will be right at your fingertips on the central touchscreen display. You can even make calls and send texts just by using your voice! Simply tell the Optima Hybrid who you want to call, or what you want to say, and it'll do the work for you so you can keep your hands on the steering wheel.